Great, you’ve got a cooker in your caravan or motorhome. But, when the weather is good, wouldn’t you rather be cooking and eating outdoors? Barbecues spring to mind as soon as that sun is shining, but there’s a whole lot more to enjoying cooking and eating outdoors that you’ll want to consider – from tables and chairs to what’s your ideal type of outdoor cooker. And then there’s the myriad of other accessories – from a citronella candle to keep unwanted insects at bay, to a coolbox to complement your fridge. Don’t cook in your awning. Canvas and any kind of naked flames don’t make good partners. Plus, the carbon monoxide that’s given off whenever burning gas is involved can actually be lethal in an enclosed, unventilated space. Indeed, keep any kind of outdoor cooker a good distance away from your caravan or motorhome, just to avoid any potential nasty accidents that could be caused by heat or even a unit toppling over unexpectedly. Similarly, do not put hot appliances – cooking units or pans – directly onto the grass around your pitch. It might cause scorching… and your campsite owner will not be happy! Think about your neighbours, especially if you’re barbecuing and/or your cooking means generating smoke. Funnily enough, fellow campsite users are usually quite happy to enjoy the delicious aromas of your cooking! If you use a gas appliance with any kind of rubber hosing, check it out. The date of its manufacture will be stamped on it. It has a “working life” of five years from the first time any gas passes through it. Cooking outdoors? We got together with family outdoor specialist Outwell to offer you these 10 tips. Place marinade and meats in a plastic bag and agitate for an even covering. Meats can be kept in a marinade overnight but fish should only be left for 20 minutes or the acid in the marinade will “cook” the flesh. Only get raw meat out of the coolbox when needed and do not allow it to touch cooked food. Use separate cooking boards and knives for fresh meat, cooked meat and vegetables, to stop cross-contamination. Keep a bowl of water and paper towels or wipes handy to wash hands between jobs. 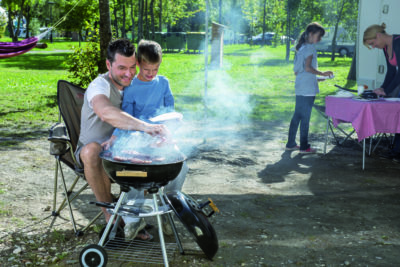 Place the barbecue (cooker) on a stable surface away from children. 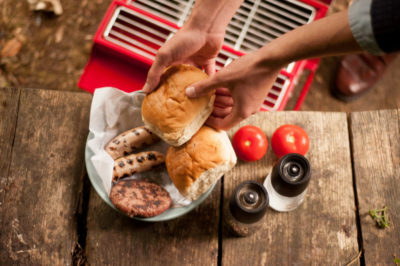 Use water from a small plant sprayer to cool a barbecue to stop it burning the food. Have a fire blanket and extinguisher nearby, along with first aid kit for burns, in case of accidents. Add rosemary to barbecue coals to infuse the meat and keep bugs away. Want tender meat? Do not prick it – you will lose the juices and dry it out. Brush meat with vegetable oil to stop it sticking to the grill. Make sure the barbecue (cooker) is cool before packing away and safely dispose of cool embers. 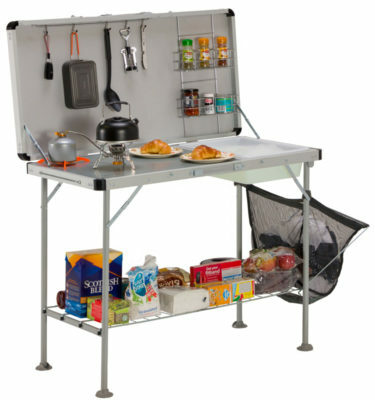 If you’re going to get serious about cooking outdoors, how about a camping kitchen? This is an upmarket model from Vango, and not only does it provide a handy worktop (including a basin) for placing a typical outdoor cooker, it also gives you oodles of storage. And all-important protection from unwanted breezes. That storage includes a mesh bag, hanging hooks, and a range of racks – perfect for having all your ingredients and cooking utensils immediately to hand. When you’re done, it all folds down to a very neat 101cm x 51cm x 14cm, while worktop height is a comfortable 100cm and the unit’s large feet will help with overall stability. How about this for something different? It might have started life as a toolbox, but this is actually a barbecue. It’s a clever adaptation of a classic design, folding out to provide a main cooking space that’s some 20cm x 38cm, and – at either side – a racked warming area and an open space (handy when you want to put down your utensils. Better still, the carry handles fold all the way round to act as legs, keeping the whole unit off the ground. Most folk can’t resist the opportunity to cook outdoors, when such opportunities arise. If you’re not lucky enough to have an external gas point on your vehicle, why not try something like this, from acknowledged expert Campingaz? 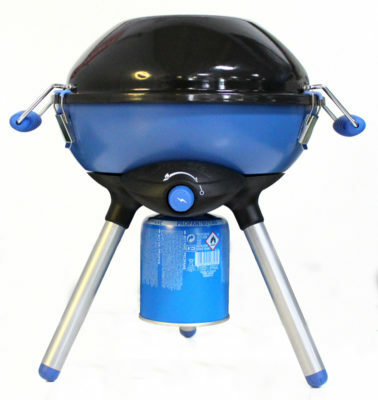 In fact, the Party Grill comes in two formats – the CV here runs from easy-to-fit cartridges; or the standard model is powered by a butane supply. Versatility is the key. It’s only a small unit, but it can cook in five different ways – stove, griddle, grill, plancha, plus the upturned lid acts as a wok. Also, its compact dimensions, along with a weight of less than 5kg – and the fact that everything, expect the gas cartridge, packs into one – means you don’t have to have a mega leisure vehicle to take it away with you. Key features All-in-one design, detachable legs, piezo ignition. 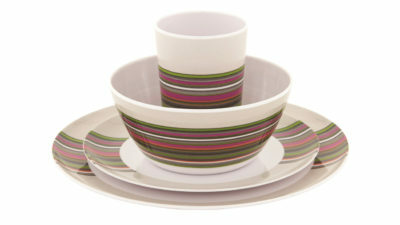 Crockery like this can help jazz up any outdoor meal. And, because it’s 100 per cent melamine, it’s virtually unbreakable (even if it does stain over time – although it’s amazing what a bit of bleach can do). Blossom is a new range for this season from Outwell, although the rest of its crockery portfolio (including collapsible designs and even bamboo) are equally stylish. 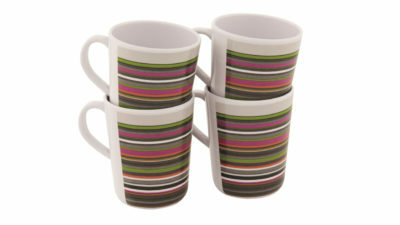 It comes in picnic sets for two or four – comprising dinner plates, side plates, tumblers and bowls – as well as sets of four handled mugs. There’s a choice of colours, too – Colombine Blue, Magnolia Red or Pogonia Green. good article although I would say that since using coralle “glass” crockery I would not go back to using melamine again. It is shock resistant, light weight,and best of all you don’t get any of that horrible staining that you do with melamine.